Bruce Mangum, Principal Accompanist; Nancy Williams, Co-Founder and Board Member Emeritus; $500 Gordon Wolf Memorial Scholarship & $250 People’s Choice Scholarship Winner, Suha Park; $1,000 California Desert Chorale Scholarship Winner, John Velazquez; Judges: Laura Stave and Delatour Zimmer along with Tim Bruneau, Artistic Director. 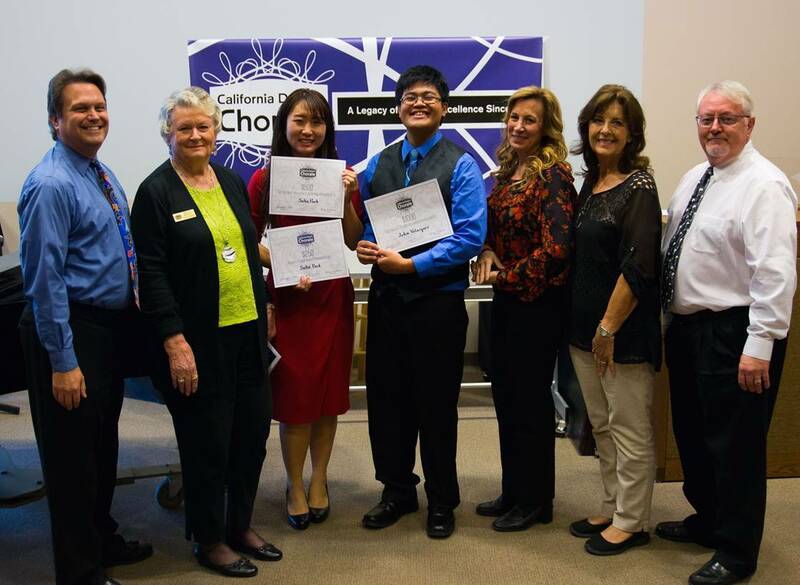 The California Desert Chorale Scholarship Program provides monetary scholarships to local high school seniors and community college students who demonstrate exceptional vocal ability and service to their communities. Since inception in 2002, the competition has helped 18 young singers continue their vocal and choral music study at the collegiate level. Awards for the competition are funded by free-will monetary contributions from Chorale members. Award money is sent directly to the winning students’ colleges. Designed to attract only serious and committed young singers, the competition sets rigorous demands for competitors. Students must secure the written approval of their parents and high school/college vocal instructors to be eligible to compete. Application forms include essay and short-answer questions designed to reveal the dedication and emotional connection to music each applicant possesses. All participating students are required to prepare two audition selections. One must be a classical aria or art song. The second may be drawn from musical theater, but no pop or jazz songs are acceptable as competition repertoire. Students must perform with the piano accompanist provided. They may not use pre-recorded accompaniment. Additionally, each student is required to participate in the entire afternoon’s educational experience, which begins with a master class and coaching session with Tim Bruneau, the Chorale’s Artistic Director, and concludes with a competitive, adjudicated recital of all applicants. When the recital ends, a panel of three judges convenes to select the winners of the $1000 California Desert Chorale Scholarship Award and the $500 Gordon Wolf Memorial Scholarship Award. And this year, for the first time in the history of the competition, the audience was asked to vote for their favorite contestants and a $250 People’s Choice Award was also presented. The Gordon Wolf Memorial Scholarship is named in honor of a treasured member of both the Chorale and its Board of Directors, who dedicated inestimable time and energy to the betterment of the organization prior to his passing in February of 2013. Past winners have gone on to prestigious colleges and to careers as professional singers and choral directors. Several have maintained their liaison with the Chorale by becoming members and singing multiple seasons with the ensemble. Soprano Haley Varela, senior at Xavier College Preparatory High School, won the $1000 California Desert Chorale Scholarship Award. Haley thrilled the audience and judges with her splendid performance of Caro Mio Ben by Giuseppi Giordani, and Tonight from West Side Story by Leonard Bernstein. Tenor Anthony Tran won the $500 Gordon Wolf Memorial Scholarship and also the first People’s Choice Award with his captivating performance of La Separazione by Gioachino Rossini And Thou Shalt Break Them from Messiah by G.F. Handel. 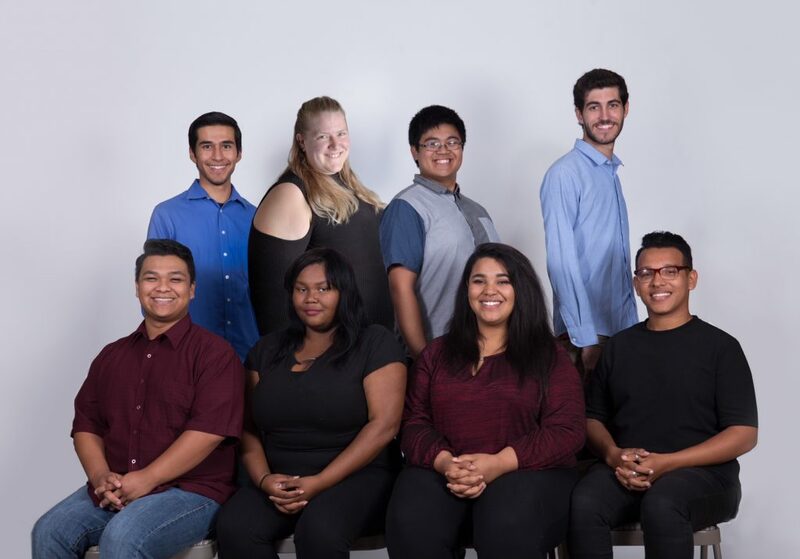 As part of our continuing endeavor to reach out to the community, California Desert Chorale has instituted a “music intern” program, in which several outstanding young musicians are invited, and sponsored by the Chorale to participate in our concert season. Returning to us this year are our senior interns, Suha Park, Daniel Guttierez, Javier Contreras, Chuy Rivera, and Janine Rivera, and graduate interns, Anthony Tran, Rebecca Rodriguez, Korin Brown, Kim Murashima, April Mejia, Christian Quevedo and Michael Graham. It is our pleasure to introduce to you our new singers who were selected, based primarily upon their demonstrated commitment to improve both their vocal technique and their musicianship. Besides being aspiring musicians, they are fantastic people, and we are so happy to have them sharing the risers with us. Welcome to the Chorale!